Very presentable example of the rare E102 "Set of 25" candy card featuring the legendary Ty Cobb leaning on his bat. While Ty Cobb was included in virtually every candy-card issue from the 1910 era, this yellow-background pose of Cobb is considered by many to be the most attractive of the few Cobb caramel-card designs. The manufacturer of E102 is unknown. The fronts are identical in design to the E101 "Set of 50" related issue. 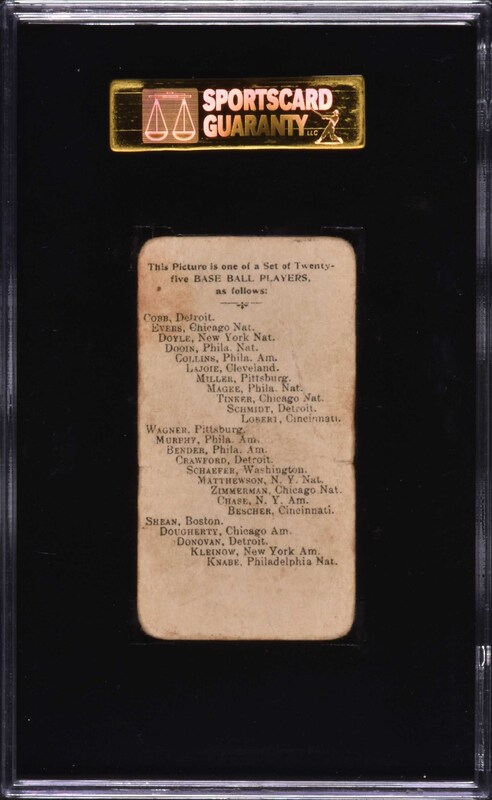 Of special note, this card is considered by some collectors to be Ty Cobb's rookie card, though a number of other issues can also lay claim to that important distinction. It is, without question, one of Cobb's earliest cards, and is very likely "tied" for the earliest insert card ever issued of "The Georgia Peach." Graded POOR 10 by SGC, the card is bright and crisp, with bold colors, evenly rounded corners, and outstanding centering. Heavy creases throughout account for the low technical grade. The reverse, which provides a checklist for the issue, is free of any paper loss. In 1909, Cobb led the league in every major batting category, including batting average, hits, runs scored, total bases, home runs, and RBI. 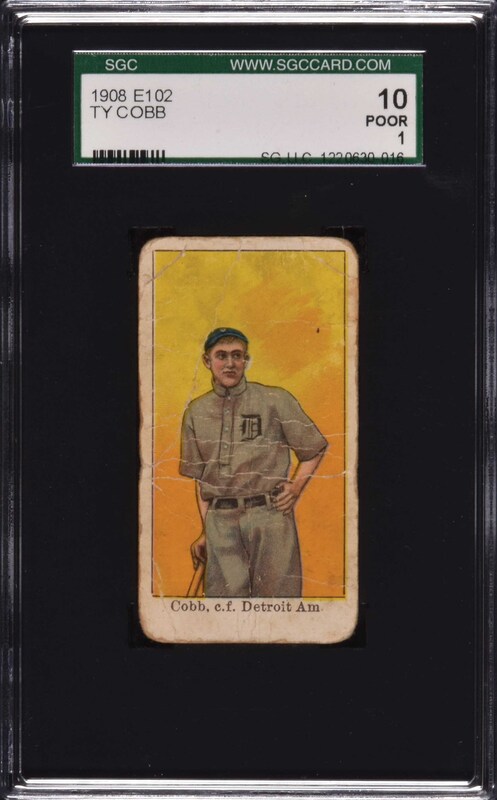 Despite its modest technical grade, this is a very pleasing yet relatively affordable example of one of Cobb's most striking and highly regarded cards dating from the very beginning of his career as one of baseball's greatest stars. Reserve $300. Estimate $500+.